HTC One going for the gold? It seems like HTC may join the iPhone 5S' auric glow as an image has surfaced purportedly showing off a gold HTC One. 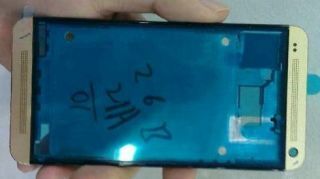 Since this is the first, and so far only image leaked, it's safe to say HTC may not actually be following in Apple's footsteps. But if true, the HTC One would join the red and blue handsets, boasting the most flashy color. Though judging from the feedback of the gold iPhone 5S, the hue hasn't been well received ... so maybe HTC should pass on the gold if it's actually considering it? Our blips are gold (but in a good, non-pretentious way).